Mention in this document of commercial goods or services does not constitute an endorsement by the Alaska Department of Fish & Game. Manufactures a 615 cubic inch (internal volume) bear-resistant backpacking food container. Approved for use in the U.S. National Park System in Alaska. Weighs 3.1 lbs with 716 cubic inch/6-8 day capacity. Height: 14 inches, Diameter: 9 inches. Heavy gauge aluminum is an excellent material for bear-resistant boxes and panniers. 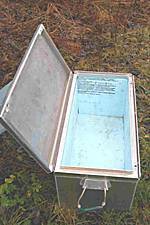 Boxes should meet USFS criteria for bear-proof containers, which include: "(a) resist a direct force of 200-pounds; and (b) contain no cracks, external hinges, gaps, etc. by which a bear can force the container open using claws or teeth." Manufacturer and retailer of certified bear-resistant aluminum panniers. Manufactures custom aluminum bear-resistant boxes for camp, boat or airplane. Seamless construction with a bear proof lid design. Manufactures bear-resistant aluminum panniers that can be used for storage. Certified bear-resistant by U.S. Forest Service. Teton Welding makes a "kitchen" pannier that could work on raft or plane trips. Steel barrels (or "drums") can be used with appropriately fastened lids for food and garbage storage. Because bears have been known to crush lighter gauge drums, it is suggested only heavier gauge drums be used. Manufactures 55-gallon drum with hinged locking lid with "bear-proof" locking mechanism. Sells 15 to 55-gallon drums with locking lids. Sells 55-gallon drums with locking lids. Manufactures 5 to 110-gallon steel drums with locking bolt rings and available phenolic/epoxy linings. Permanently mounted containers for campgrounds, businesses and homes are among the most effective devices for keeping bears from human food sources. 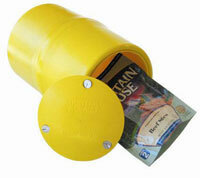 This company manufactures "Hid-A-Bag" bear-resistant containers from 32 gallons to 6 cubic yards. 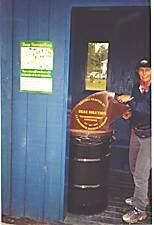 These permanently mounted containers are in use in over 250 national, state, and provincial parks across Canada and the United States including Talkeetna, Alaska. Haul-All also manufactures a complete bear-resistant refuse collection system, which consists of specially built trucks and containers. Bear Necessities Waste and Food Storage, Inc. Manufactures bear-resistant containers for campgrounds and permanent installation. Sized from 60 to 200 gallon. Self-closing top doors, emergency release chain on rear door allows for the event a child may crawl in and become trapped. 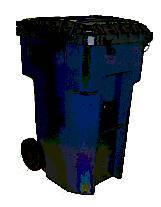 Company also makes "hydraulically activated waste containers for community collection stations. Manufactures permanently mounted trash and food lockers with "bear-resistant lids to keep you compliant with local ordinances." Manufactures a full complement of 2 to 8 yard dumpsters, both front and rear loading, and a 95 gallon rollaway "tipper cart." And wall mounted food lockers for cabins and unique applications. Containers are used by state agencies in Colorado and Montana, U.S. Forest Service, U.S. Army and Air Force. Supplies bear-proof food storage lockers in three different sizes, from 15 to 24 Cubic feet. Uses a two-point self-latching system with an inner, easy to operate child safety latch release mechanism. Manufactures 64 and 95 gallon "modified, bear-resistant, roll-out carts" available for purchase. Manufactures "The Bear Cart" 96 Gallon Bear-resistant, roll out cart with solid, threaded steel lid hinge bar. Rents Cascade tipper carts to garbage pick-up subscribers on the Kenai Peninsula. Manufactures steel containers for residential use. Used widely in the Lake Tahoe area. Manufactures campground food storage, public use trash enclosures with chutes and low cost residential trash can enclosures. Trailhead boxes and custom aluminum fabrication are also available. Enclosures are ADA accessible and have been tested on brown bears. Manufactures 2 to 8 yard front-loading dumpsters. 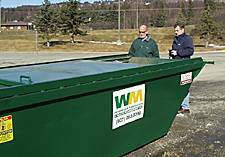 Manufactures bear-resistant dumpsters from 2 to 40 yards. 2 and 4-yard bear-resistant models are in use on the Kenai. This company has supplied dumpsters for use in National Forests and the grizzly recovery area in Montana. Manufactures 2,3.4-yard dumpsters. Approved for use in Great Smokey Mountain National Park. htpp://www.haulall.com Manufactures a very widely used bear-resistant system-requires conversion to entire system-bins plus specialized trucks. Approved for use in U.S. National Parks. System is used in Prudhoe Bay oilfield where both grizzly and polar bears present. Large steel shipping containers are almost certainly bear-proof and can be used for permanent and semi permanent storage. Sells and leases 20-40 foot walk-in style steel shipping containers-generically called "conex"-that meet international shipping standards. Conexes have been used at oil exploration and production sites in both grizzly and polar bear habitat. NOTE: In northern Canada outfitters and remote camp owners store equipment in the off season in small-corrugated steel grain silos fitted with a bear proof lock on the man-door. No vendor is known for Alaska.